On the basis of end-user type, the Microsoft dynamics services market is classified into BFSI, telecom and IT, retail, healthcare, manufacturing, and others. 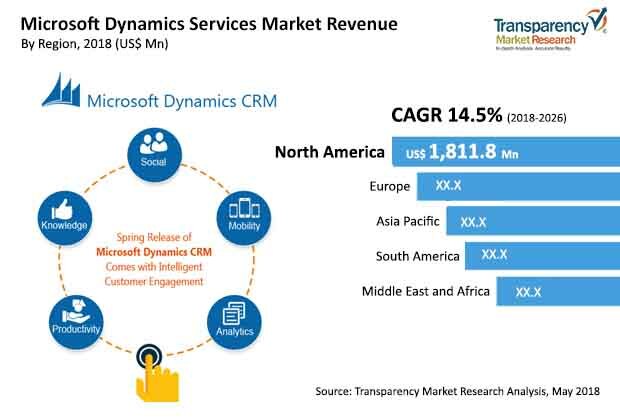 Amongst the pack, IT and Telecom segment is anticipated to be a major revenue generator in 2026.The global market for Microsoft Dynamics services market is expected to rise at a 14.5% CAGR during the forecast period from 2018 – 2026. During this period the market is anticipated to be valued at US$ 11239.5 mn. Presently North America holds the leading market share of 45%, but Asia Pacific region is expected to become the fastest growing market in years to come.